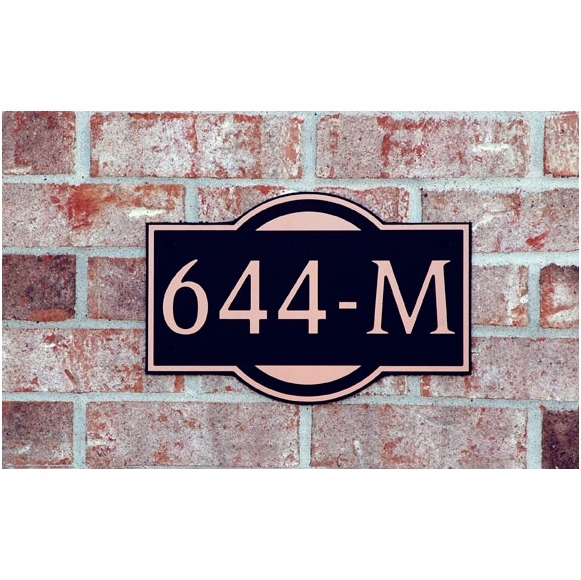 Address Sign Personalized Designer House Number Plaque - - wall mount house number plaque with unique decorator styling. Holds one or two lines of custom engraved text. Made in USA. Comes in two sizes: 12"L x 8"H and 16" x 11"H.
The 12" x 8" plaque holds up to seven (7) characters on each line. Character count includes spaces and punctuation. For example, the one-line sample shown above has five (5) characters. The 16" x 11" plaque holds up to fifteen (15) characters on each line. Character count includes spaces and punctuation. For example, the two-line sign shown in the small image has fifteen characters on Line 2. Please be sure that the plaque you order is big enough to hold the number of characters you type into the personalization boxes above. Black plaque is made of maintenance-free, fade-resistant composite plastic. Three-dimensional, metallic-faced text and trim come in three beautiful metal colors: copper, gold, and nickel. Includes long-lasting stainless steel mounting hardware.